Heat oven to 450°F. Place pie crust in 9-inch tart pan with removable bottom, trimming excess dough as necessary. Bake 8 to 10 minutes or until golden brown. Reduce oven temperature to 375°F. Meanwhile, in medium bowl, mix oats, brown sugar, 1/2 cup flour, the cinnamon and salt. With pastry blender or fork, cut in butter until mixture looks like coarse crumbs. In large bowl, mix strawberries, raspberries and blueberries. Gently fold in jam, 1/4 cup flour and the orange liqueur. 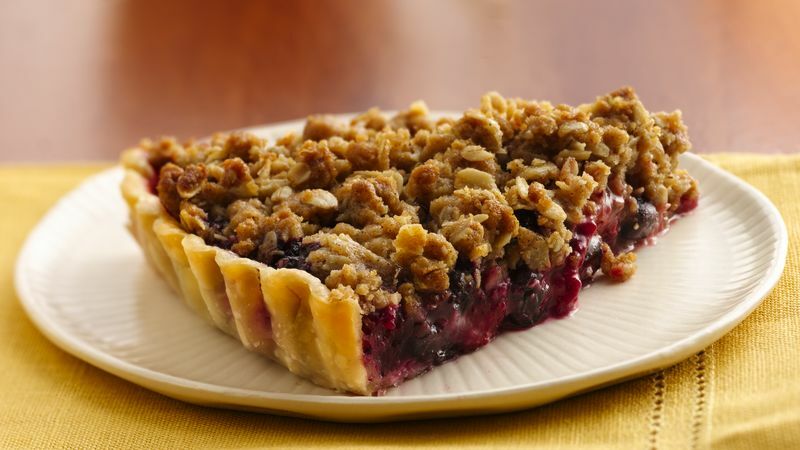 Pour fruit mixture into warm pie crust. Top with crumb mixture. Bake at 375°F 30 to 35 minutes or until topping is golden brown and fruit just begins to bubble. Cool 1 hour; remove side of tart pan.